Sunny Chateau--New Granite kitchen! Great open feel. Lots of SNOW! Enjoy the beauty of the mountains from the view point of this sunny open cabin. Facing south, the sun adorns your stay from just the right angle and the bright cabin is alive with light. 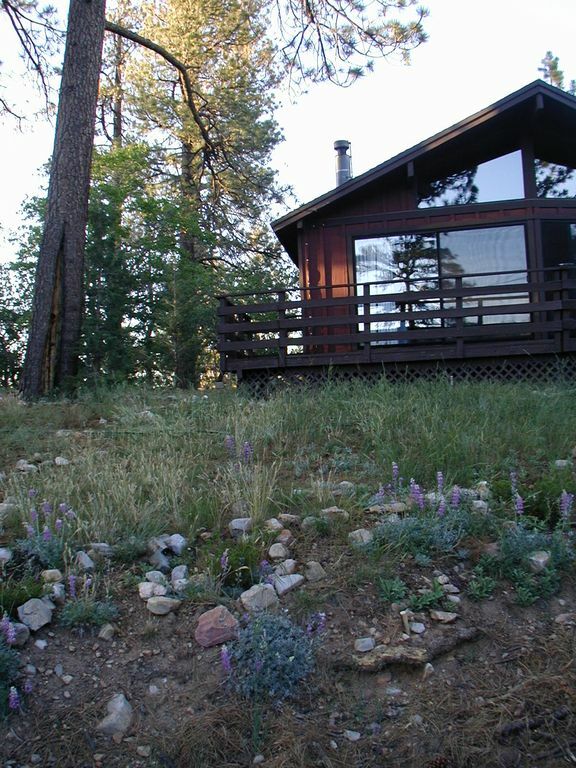 Located on one of the nicest, quietest streets there is easy access with no stairs to the cabin and a large, flat parking pad. Sunny Chateau is located in Upper Moonridge at 7500 feet, where it snows more often and the snow lasts longer. Well appointed two bedrooms with one bathroom plus one half bath. You can sit in the living room and watch the squirrels and wildlife just outside your door through the full wall of windows. There's also a great snow play area for the kids on the property. Just a short drive to the lake and slopes, but enough away to feel you are in the mountains. The main bathroom is newly remodeled with granite counters and pristine tile. The additional half bath has new flooring and pedestal sink. The large open kitchen is just newly remodeled with all new granite counters, white cabinets and new flooring. Kitchen sink looks out to trees and mountains in the distance. Handy to have a washer dryer in the house. Being our second home the kitchen has everything you need cook and enjoy a home cooked meal. Large TV in living room with cable TV, is wifi connected to Netflix through the DVD player. For more reviews/guest comments, go to 'About Wendy Rockwood' in the owner info below. Wendy and Chuck are longtime residents of Santa Barbara and Big Bear California. We are happy to share our love of these communities with guests. In fact, that is what makes being vacation rental owners of five properties and managing them ourselves so rewarding. We have made many happy memories in all of our properties (we have lived in each one of them) and can share all the special features and local ideas with guests. We love gardening, biking around the lake, walks/hikes in the area and spending time with our own family which includes three grown children and five grandchildren and a great granddaughter! This was our first purchase in Big Bear. We looked long to find this location and fell in love on the first visit to Sunny Chateau. The open feel of the cabin, flat parking and being on a quiet street were what attracted us right away. It never disappoints and we have had many happy memories in this cabin. Just a short drive to Snow Summit it was easy to drop off our daughter for the excellent ski school. She learned to ski there and we could be relaxing back at the house ready to go pick her up easily when she is done. Cozy, single floor floor plan. It has all the amenities, dishwasher, washer/dryer, fireplace. The deck is great in summer and there is plenty of area for snow play. Parking is on a flat parking pad and has easy access. With having a direct relationship with the owner/manager you will deal with one person from your booking to any necessary details during your stay. Plenty of everything you would need. Just redone summer of 2018. All new cabinets, counters and flooring. New pictures soon! All the amenities you would need are included - Full Kitchen, Deck/Patio, Mountain View, washer/dryer, dishwasher, two TVs one with VCR and the other with a VCR and DVD, high-speed Internet and cable TV will keep you connected during your stay. There is a full kitchen with all dishes and utensils, games and a small collection of DVDs, and an outdoor barbecue are there for your use. Cozy up with the fireplace and the cabin warms easily with two heaters on separate thermostats. Sleeping accommodates six with a king bed in the master bedroom and a queen and bunk beds in the second bedroom. All beds have down comforters. My family of four loved this home, the yard and location. We really enjoyed the kitchen, fireplace and views. My girls were able to play and slide in the yard right outside our door. This was a great winter weekend getaway. I would rent again in a heartbeat! We went up to Big Bear with our three kids for a little getaway from the city and some snow play for the kids. The house is very clean, cozy, and comfortable. The kitchen is fully stocked with plates, glasses, silverware, pots, pans, etc. Beds are comfortable. Lots of board games to play while warming up by the fireplace. Will definitely book again. We had a great time at Sunny Chateau, the cabin has a very nice kitchen and bathroom that have been renovated. It has lots of windows and 2 sliding doors that let you enjoy the view. Wendy, the owner is very nice and informative. Definitely, a very nice place to spend your vacations at Big Bear . Thank you! We are so glad you enjoyed your stay! Big Bear is special and we are glad other families get to enjoy our special spot. Your family was a joy to host. Come again. We had a wonderful cozy time. Fully appointed kitchen, comfy beds, cozy and cute! The cabin was super clean and all the information to the house was all right there. An amazing property with an awesome view of bear mountain. Wendy was super helpful and a great experience. We had a great time at Sunny Chateau. It was very comfortable and had all the amenities we needed. The only reason I did not give it a 5 is because it was dusty. Always a two night minimum. Never do one night stays. I do not split weekends, so if you take one weekend night the other is at weekend prices as well. Security fee is refundable after stay.